Surround® Air Ankle Injection molded shells help minimize ankle rotation and inversion/eversion without restricting plantar or dorsi-flexion. Two full-length pre-inflated air chambers lined with soft foam help reduce swelling and enhance circulation. A soft, plush liner covers exterior of bladders to help maximize patient comfort and prevent skin irritation. Air valve at proximal end of bladder allows for simple adjustment of air when desired by using filling tube. Soft foam heel pad provides easy adjustment for proper fit. 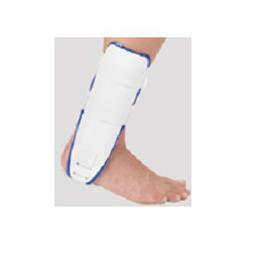 Ideal for acute ankle sprains and strains, chronic instabilities, and prophylactic use.